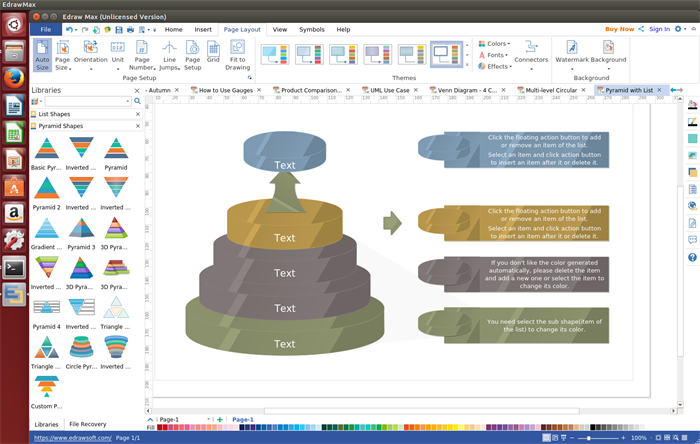 Edraw Linux pyramid diagram software has the ability to help you create professional and appealing pyramid diagrams with a few mouse clicks. 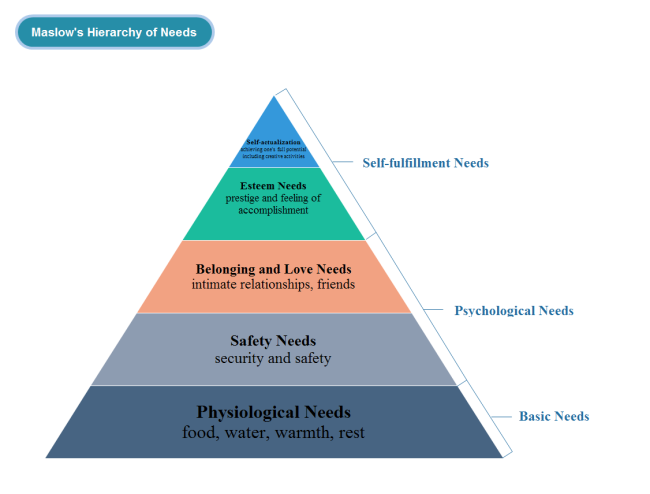 Pyramid diagram is just a reversed funnel chart with no neck which is a pretty useful tool to illustrate the foundation-based relationships. Edraw pyramid diagram software for Linux simplifies the diagram drawing process and almost enable users to be hands free by offering abundant ready-made pyramid shapes and templates. And it also makes diagram sharing easy by exporting diagrams to common formats that most people support. 1. Lifetime upgrades guarantee with cheaper price make Edraw the best replacement of Microsoft Visio. 2. A full-suite tool which can not only create pyramid diagrams, but also create Venn diagrams, circular diagrams, highlight shapes, lists and so on. 3. 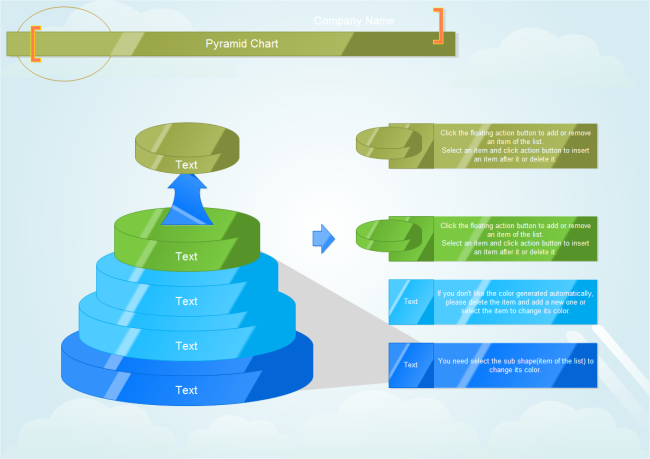 Built-in editable pyramid shapes and templates make diagram creating much easier than you think. 4. Never mind if you can not find the shapes you want since prepared drawing tools are provided for you to free design any shapes you like. 5. 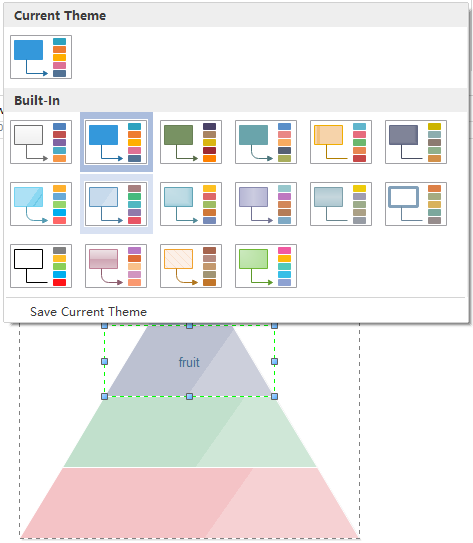 Multiple attachments insertion makes the pyramid diagram tidy in visual effect but rich and convincing in contents. 6. It is extremely convenient to share diagrams by exporting it to the common formats the people whom you want to share with support. 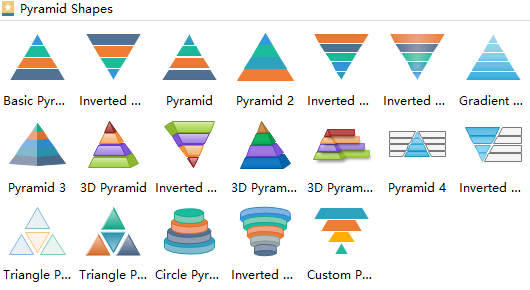 Edraw provides a variety of pyramid shapes in the left libraries. Just like below picture shows. All the shapes are editable, so uses can easily edit them to fit their different needs. Or create new shapes with embedded drawing tools. Below is a step-by-step guide to help you create a pyramid diagram on Linux in minutes. Step 1. 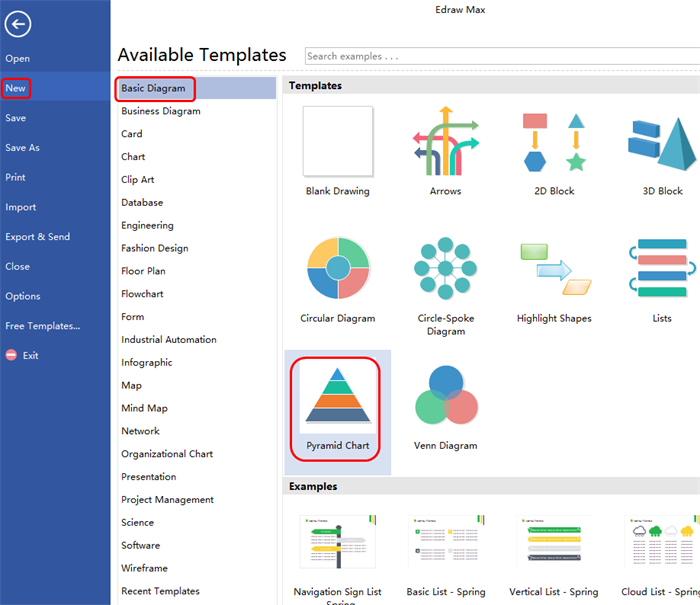 Start Edraw, navigate to File menu > New >> Basic Diagram, then double click the icon of Pyramid Chart to open a new drawing page. Or get a quick start by clicking the built-in templates. Step 2. Drag a pyramid shape you want and drop on the drawing page. Just edit the block size, sequence and color if you do not like the predefined ones. Step 3. Add contents by double clicking the blocks directly or clicking Text to open a block, then add contents. Click the action button to add more blocks if necessary. Step 4. Switch to Page Layout and choose a theme you like from built-in themes to make the pyramid diagram more appealing and eye-catching. Step 5. 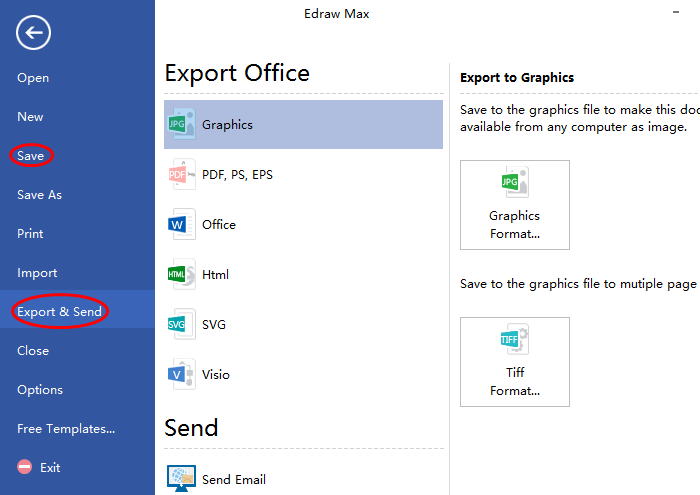 Go back to File menu, click Save to save the diagram as default .eddx; or click Export & Send to export it to common formats with the purpose of shareing with others more conveniently. 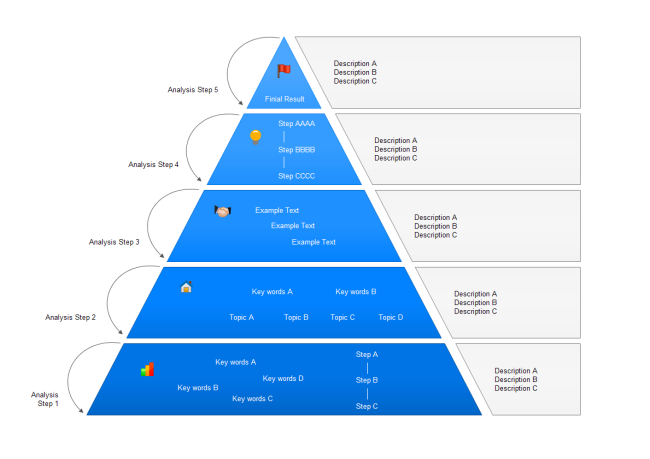 Following are popular pyramid diagram examples designed by our pyramid diagram software for Linux. All of examples Edraw provided are downloadable and editable. So please feel free to download, edit, share and print any one of them if you like.